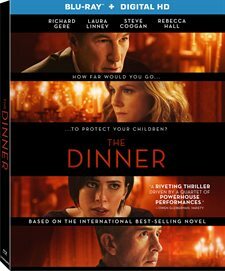 Download The Dinner in Digital HD from the iTunes store. The Dinner images are © Lionsgate. All Rights Reserved. 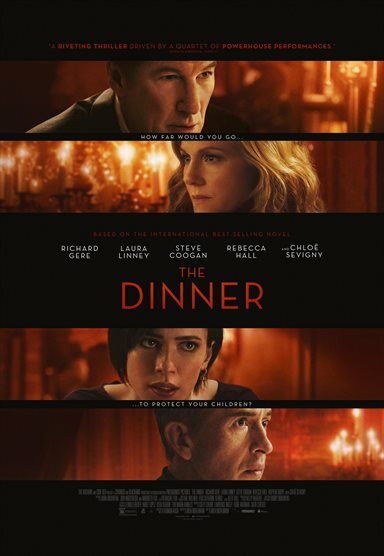 You're invited to see "The Dinner" for a not so fun and yet thought provoking two hours. At first, you'll be confused, at least, I was, by the narration and exactly what is going on in this third incarnation (Dutch and Italian were first & second) of Herman Koch's 2009 book about two estranged brothers and their families. (Chloe Sevigny), Stan's first wife. We learn about Paul's mental struggle and the way the two brothers' children have grown up. It takes quite some time before we realize why the brothers have met to have a discussion, and exactly what the discussion entails. Without giving too much away, the movie's focus truly is on to what lengths people will go for the sake of their children. Michael (Charlie Plummer) is the son of Paul and Claire, while Stan's sons are Rick (Seamus Davey-Fitzpatrick) and Beau (Miles J. Harvey). All have played a part in an incident that becomes more clear as the movie nears its finale. Audiences who like their films straight forward and to the point may find this takes too much of a toll on their patience, particularly with the way it jumps back and forth in time and its unclear ending. I grew weary of the family members storming away from the dinner table, for example, as a gimmick to allow certain characters to speak in private. I enjoyed watching the solid performances and was ultimately shocked by what transpired. Gere was well suited to this role and Coogan matches him, Hall, and Linney nicely. The Blu-ray is presented in 1080p High Definition video with a 2.40:1 aspect ratio and is sharp with deep blacks. The DTS-HD Master 5.1 audio is well mixed and no dialogue is lost as the conversation continues throughout the film. The only extras on the Blu-ray disc include a photo gallery and audio commentary. While the latter was interesting and informative, I would have also enjoyed interviews with the cast discussing the story and their characters. It's a real good conversation starter, after the movie, when you ask your friends "What would you have done?" It's not an easy conversation to have, or an easy movie to watch, as the subject matter is tough but the overall feel, while not as good as the Italian version, is a solid film with a strong cast.